Pies are not my forte. I rarely make them, and frankly, they're not my favorite to eat, either. However, I saw that Fika med Eleonore, a fairly new-to-me Swedish blog, had a cookbook challenge where she wanted everyone to try out a new recipe for - you guessed it, pie - I knew I wanted to join in. I leafed through all my new cookbooks (I gave myself a large stack for christmas) and settled on a chocolate pie from The Homesick Texan cookbook. I first attempted the pie dough recipe from the book, which intriguingly uses oil rather than butter. I thought I'd chill it overnight, but apparently that was a bad move- it separated and turned into a mess. So, I turned to a recipe in Martha Stewart's Pies & Tarts, but I'm not repeating it here as I wasn't super successful. As usual, I should add. I never seem to make really good pie crusts, but again, I don't really like any pie crusts... Do you have a fool-proof crust recipe? I'd love to try it, so please share! The whole thing turned out to be pretty good! Not great, but good. My meringue shrank a lot, which was sad - it was so pretty when I took it out, but it seemed to deflate as it cooled. Tips on how to avoid this will be greatly appriciated! Start by baking the pie shell for 15-20 minutes at 175°C. It should be lightly golden. Whisk together all ingredients except for vanilla and butter in a small saucepan. Cook on medium heat, for about 7-10 minutes, while stirring. The filling should get really thick, as it won't thicken more in the oven. Remove from heat, and add the vanilla and butter. Pour the filling into the pre-baked pie shell, then spread the meringue on top. (I piped mine but that's optional.) 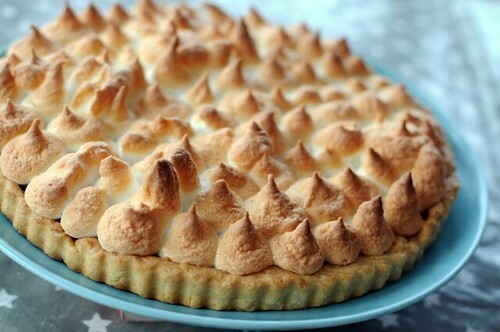 Bake until the meringue is golden, 10-15 minutes. I enjoy your blog and recipes so much! How delightful for you to be expecting again! Congratulations! Here is an easy recipe for pie crust, the only one I use. Measurements are American. Mix liquid into flour, chill, roll out. This should be enough for 2 nine inch pies. If you want to make only one pie just beat the egg up with a fork in a cup, and dump about half down the drain or give it to a pet or whatever. If you make an apple pie, try putting in a bit of clove, like my great grandmother from southern Sweden did. Jag gjorde en citronmarängpaj häromdagen och den gräddades i 1h, 150C i nedre delen av ugnen och marängen blev inte mindre, däremot sjönk den ner lite i mitten, men bra konsistens, så det kanske kan hjälpa? Jag letar fortfarande efter det perfekta pajskalet till söta pajer, inget tycks vara bra, men jag gör inte heller paj så ofta. For meringue topping she says to use *5* egg whites for a nine inch pie, or 1/2 cup of egg whites before beating. The sugar amount is 10 tablespoons, and you can also add 1/4 teas of cream of tartar at the end of the beating. Ms. Wakefield stated that at her restaurant they "packed" the meringue down on the pies, being sure that it touched the crust sufficiently at all the edges. She also stated that one should spread the top smoothly for even browning. She also said that the eggs should be over 1 day old, but not over 1 week old. The original edition of this cookbook is from the 1930's, so she must have had a source of farm eggs. I come from a long line of women(4 generations!!) who can't make good pie crust, so i certainly can't help you, but I totally sympathize! =) I've started just buying trader joe's frozen crust. I once made a beautiful pie crust at my friend's house. She has marble counters, maybe that's the trick? They keep the crust cool as you roll it out?